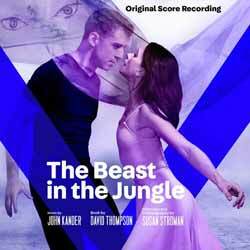 Famed for its capturing of new and varied Cast Recording, and its excellent studio and 'Live from Feinstein’s/54 Below' vocalist recordings, Broadway Records take a different turn with their newest release, a music-only Score recording of John Kander’s The Beast In The Jungle. The Beast in the Jungle is the story of John Marcher, a man haunted by personal demons, whose great yet unfulfilled love affair with an unforgettable woman spans decades and continents. With an instrumental score of waltzes by four-time Tony Award winning legend John Kander, book by two-time Tony nominee David Thompson and dazzling choreography that traverses the worlds of ballet and contemporary dance by five-time Tony Award winning director and choreographer Susan Stroman, this powerful and romantic tale of love and loss reunites the remarkable creative team behind The Vineyard Theatre’s acclaimed The Scottsboro Boys. Produced by Michael Croiter and David Loud, and co-produced by Kumiko Yoshii, Una Jackman and Jay Alix, The Beast in the Jungle captures John Kander’s score, orchestrated by Greg Anthony Rassen and Sam Davis. The award-winning design team includes scenic and costume design by Michael Curry (Frozen), lighting design by Ben Stanton (Fun Home), sound design by Peter Hylenski (Frozen), and music supervision by David Loud (The Scottsboro Boys). This recording came to me after a brief ‘vacation’ from listening and reviewing, and it was one that I hadn’t heard of before. The Beast In the Jungle, billed as ‘A stunningly original new work fusing dance, drama and music, premiered at the Vineyard Theatre on E15th Street in New York earlier this year. It’s a dance and drama piece, so no vocals here, and I must admit I do struggle sometimes with albums like this. However, I really enjoyed listening to this. As always, Kander’s melody is haunting and drags you into the piece, and this is helped by the wonderful production on the album, and the sensitive orchestrations by Greg Anthony Rassen and Sam Davis. They never overpower the melody, and don’t always play safe. The music reminded me much of some of the The Visit, which I reviewed a couple of years ago, and this album is produced, as that one was, by Michael Croiter. What’s even more impressive is that the music on this recording is produced by just nine musicians, and no keyboards or electronics in sight. It’s refreshing to hear something like this that isn’t over produced, and sounds so natural. It’s not the sort of CD I would pick tracks from, as it really is something you need to sit back and take in as a whole. There are superb liner notes provided by David Thompson, which accompany the listen well. And as always, the package design by Robbie Rozelle is up there with the very best. Something different, but well worth a listen.